Get On Time Delivery Of Packaging Products. 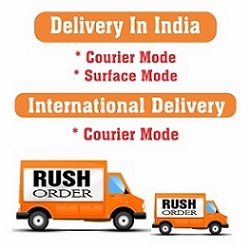 Modwrap.com deliver the products in & around INDIA and operate fast delivery mode worldwide. We ship your goods in a variety of ways, either using our own transport or with couriers including FEDEX, TRACKON. The order will be delivered between 8.00 am and 5.00 pm. We offer two delivery services, Next Day Delivery which is 1-2 days & Economy Delivery which is 3 - 5 days. You will get email updates regarding the tracking and delivery process of your order. We use a courier network for smaller consignments up to 180kg per consignment and a pallet delivery network for large bulk orders. All deliveries must be signed for. Should you fail to be present to sign for the delivery and act on the information left by the courier, then the goods will be held at the nearest local depot and the delivery re-booked. This will incur extra charges subject to which service has been used. is only available in India. If the order has been received and paid for before 1pm that day and stock is available then it will be delivered next day of the order but in case of non-availability of stock for the Next Day Delivery, The customer will be informed via Telephone / email about the standard delivery schedule. Next Day Delivery system involves extra cost as compare to Economy Delivery system. If your delivery should not arrive on the expected delivery date then please inform us immediately. Pease quote your name, order number if applicable and postcode. If you have no delivery at all then you must report this within 5 working days of the expected delivery date. Failure to report a lost or missing parcel within the time frame and we will not be responsible for it's replacement subject to reason. The cost of delivery is separately shown in the billing so that the customer should be informed about the cost incurred in the delivery of products. is available if the order has been received and paid for and stock is available. The order will be delivered within 3-5 days. We make every effort to dispatch your goods within 24hrs subject to payment being received and availability of stock. If stock is not available on a particular item then we shall inform you by telephone/email of the earliest dispatch date. If your delivery should not arrive on the expected delivery date then please inform us immediately. Pease quote your name, order number if applicable and postcode. If you have no delivery at all then you must report this within 5 working days of the expected delivery date. Failure to report a lost or missing parcel within the time frame and we will not be responsible for it's replacement subject to reason. The cost of delivery is separately shown in the billing so that the customer should be informed about the cost incurred in the delivery of products. Orders placed on Saturday or Sunday are dispatched on Monday.